Solitary or multiple renal cysts are common, especially with advancing age: 50% of those aged 50 years or more have one or more such cysts. 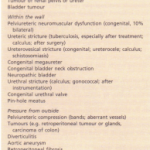 They have no special significance except in the differential diagnosis of renal tumours . Such cysts are often asymptomatic and are found on excretion urography or ultrasound examination performed for some other reason. Occasionally they may cause pain and/or haematuria due to their large size or bleeding may occur into the cyst. Adult polycystic renal disease (APeD) is an important cystic disease of the kidney that is relatively common. In the large majority of cases, inheritance is in an autosomal dominant manner as a single gene defect linked to the ahaemoglobin gene locus on the short arm of chromosome 16. It is manifested in infancy as tiny cystic lesions distributed throughout both kidneys and should be distinguished from juvenile nephronophthisis (see below). The precise mechanism for cyst formation is disputed. With advancing age the cysts enlarge at a variable rate, often at the same rate within family groups but at different rates between different families. There is progressive asymmetric renal enlargement, with compression of intervening renal tissue and progressive loss of excretory function. • Development of hypertension or symptoms of uraemia The natural history of the disease is one of progressive renal impairment, sometimes punctuated by acute episodes ofloin pain and haematuria and commonly associated with the development of hypertension. It is popularly believed that there is an increased incidence of UTI in patients with APeD. There is little evidence to support this, but if such patients do develop infection it may be more difficult to eradicate. As mentioned earlier, the rate of progression to renal failure is variable but tends to follow the same pattern in families. Some may reach endstage renal failure at 40 years but others survive to 70 years or more. Approximately 30% of patients with APeD have hepatic cysts; these rarely cause liver dysfunction. Cysts may more rarely develop in the pancreas, spleen, ovary and other organs. Berry aneurysms of the cerebral vessels (10- 30%) are not infrequent and may result in subarachnoid or cerebral haemorrhage. Renal neoplasms may develop in polycystic kidneys and are difficult to diagnose. Polycythaemia and mitral valve prolapse are not uncommon associations. Physical examination commonly reveals large, irregular kidneys and possibly hepatomegaly. Definitive diagnosis was previously based on excretion urography, but is now more easily established by ultrasound examination . 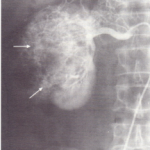 However, such renal imaging techniques may be equivocal, especially in subjects under the age of 20 years. The disease is always progressive. The most important aspect of management is regular blood pressure recording in affected patients, with control of hypertension as it develops. Uncontrolled hypertension accelerates the loss of kidney function. Some patients may develop salt and water wasting as the disease advances, when salt replacement with Slow Sodium can improve excretory function. Many patients will require renal replacement by dialysis and/or transplantation. The children and siblings of patients with established APeD should be routinely offered screening. We believe that this should be offered to identify patients with this disorder, who must then have regular blood pressure checks and should be offered genetic counselling in respect of family planning. Screening should not be carried out before the age of 20 years, as excluding the condition may be difficult and hypertension is unusual before this age. Even at this age, renal ultrasonography may give a false-negative result. Gene linkage analysis can be utilized in many families. Developing early in childhood, juvenile nephronophthisisis commonly inherited in an autosomal recessive manner. A similar condition developing later in childhood (medullary cystic disease) is inherited as an autosomal dominant trait, but sporadic cases occur in both conditions. Despite its name, the dominant histological finding is interstitial inflammation and tubular atrophy, with later development of medullary cysts. Progressive glomerular failure is a secondary consequence. The dominant features are polyuria, polydipsia and growth retardation. Diagnosis is based on the family history and renal biopsy, the cysts rarely being visualized by imaging techniques. Medullary sponge kidney is an uncommon but not rare condition that usually presents with renal colic or haem aturia. Although it is most often sporadic, a few affected families have been reported. The condition is characterize by dilatation of the collecting ducts in the papillae, sometimes with cystic change. In severe cases the medullary area has a sponge-like appearance. The condition may affect one or both kidneys or only part of one kidney. Cyst formation is commonly associated with the development of small calculi within the cyst. In about 20% of patients there is associated hypercalciuria or renal tubular acidosis. Hemihypertrophy of the skeleton has been described in this condition. 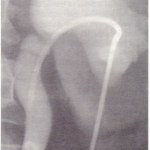 The diagnosis is made by excretion urography, which shows small calculi in the papillary zones with an increase in radio density around these following injection of contrast medium as the dilated or cystic collecting ducts are filled with contrast. The natural history is one of intermittent colic with passage of small stones or haematuria. Renal function is usually well maintained and renal failure is unusual, except where obstructive nephropathy develops owing to the growth of stones in the pelvis or ureters. Agenesis may be bilateral or unilateral. Unilateral agenesis (‘solitary kidney’) occurs in 1 in 1000 of the population. It is usually associated with compensatory hypertrophy of the single kidney and normal renal function. Save for the potential hazard of trauma to this solitary kidney, it has no clinical significance. Renal hypoplasia (failed development) of one kidney is uncommon, and hypoplasia of both kidneys is rare. It may be difficult to distinguish unilateral renal hypoplasia from a small kidney due to renal artery stenosis, obstruction or reflux nephropathy in early life. Clinical interest in the condition most often arises in patients with hypertension, where the small kidney may be considered the cause. If the small kidney is shown by radioisotope studies to contribute no useful renal function and if the hypertension has developed in a young subject or is difficult to control by medical treatment, nephrectomy should be undertaken. Defects in embryological renal development may lead to ectopic or maldeveloped renal systems. At the risk of oversimplification, the kidneys may be thought of as developing in the embryo as one structure in the ‘pelvic’ area, migrating upwards and separating with growth. Failure in normal development may result in failure of the kidneys to migrate normally and indeed they may fail to separate. This results in a ‘pelvic kidney’ when one or both remain in the pelvis, a ‘crossed ectopic kidney’ when both have moved to the same side of the spine, a horseshoe or discoid kidney when there is partial (usually fusion of the lower poles) or total failure of separation. In clinical practice the main problem associated with ectopic kidneys usually relates to impaired urinary drainage with secondary obstruction or stone formation. This may be compounded if infection supervenes, the poor drainage making eradication of infection difficult and predisposing to stone formation. Pelvic kidneys may interfere with parturition. Familial renal disease is in general rare, but there are anumber of familial conditions that, among other things, can affect the kidneys. 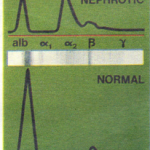 Alport’s syndrome Alpert’s syndrome is a rare condition characterized by hereditary nephritis with haematuria, progressive renal failure and high-frequency nerve deafness. It is principally expressed in males and both X-linked and dominant modes of inheritance have been postulated. Some 15% of cases may have ocular abnormalities such as cataract, conical cornea and dislocated small lens. The disease is progressive and accounts for some 5% of cases of endstage renal failure in childhood or adolescence. Anti- GBM antibody does not adhere normally to the glomerular basement membrane of affected individuals. Renal tubular transport defects include cystinuria, X-linked hypophosphataemia, Hartnup’s disease, adult Fanconi syndrome, galactosaemia and fructosaemia. They are discussed. Renal glycosuria, in which there is glucose in the urinein subjects demonstrated to have normal blood glucose levels, who are not starved and who have no other urinary bnormality, is uncommon. Such patients have either a defect in the tubular threshold for reabsorption of glucose in the proximal tubule (a ‘splayed’ reabsorption curve) or a defect in the maximal tubular reabsorption of glucose. Both autosomal dominant and recessive inheritance have been postulated. It has no clinical significance except in the differential diagnosis of patients with diabetes mellitus or other tubular disorders such as the Fanconi syndrome.